We are starting the year 2018 with news about our flagship event in Cologne: a new name 'Zukunft Personal Europe' will now reflect its European orientation, and it is now part of a series of events named 'Zukunft Personal', which combines the leading expos, events & conferences for the world of work under one single brand name. Zukunft Personal Europe takes place in Cologne from September 11-13, 2018 and is the biggest ExpoEvent covering all aspects of the world of work. It functions as a catalyst and connects people and markets with an international outlook in the fields of HR management, digital transformation, and leadership. On three days, conference-quality presentations, innovative products, and networking in the community take center stage: senior executives, HR professionals, and influencers of the working world attend Zukunft Personal Europe to gain that all-important market overview, and to swap ideas about today's and future trends. 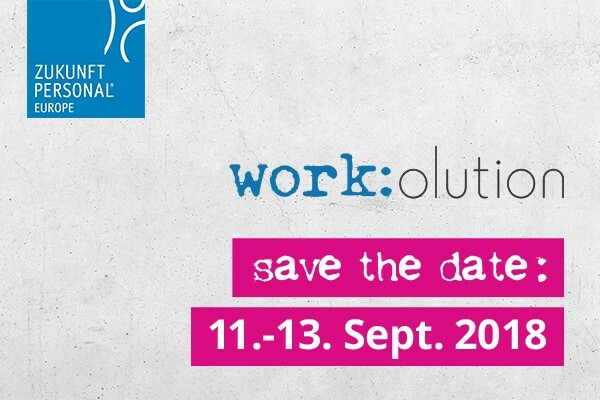 Stay tuned - the Zukunft Personal Europe is continuing the key topic „work:olution“ with a new, forward-thinking focus. Find more information at Zukunft Personal Europe. Your promotion code gives you free entry (worth 145,00 €) on all the ExpoEvent days. 1. Register your promotion code (ZPE18_NVP) prior to the event on www.zukunft-personal.com/europe/tickets. Please enter the code by clicking on "click here to enter a promotion code". Afterwards the appropriate ticket category will appear. 2. After successful registration you will receive a confirmation e-mail containing your Ticket-PDF. 3. Print your PDF and bring it along to the fair. 4. With your Ticket-PDF you can print your visitor badge on-site and quickly access the venue. Please note: after registration your Ticket-PDF is personalised and can no longer be transferred!